15th March 2002 put an end to months of rumours, all speculating with varying degrees of accuracy that American electro-popstar Madonna Ciccone was signed to perform the title song for Bond's 20th 007 adventure, "Die Another Day". Within a week the artist was in studio recording her first version of the title track. Of the news, Anita Camarata, EVP of MGM Music said: "Madonna is a brilliant artist who continues to have enormous appeal. She has an excellent feel for writing and performing music in films and we are proud she will contribute her talents to Die Another Day". 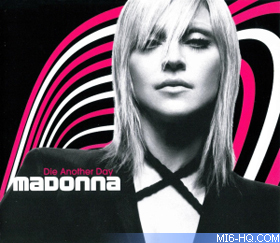 Madonna co-wrote and produced "Die Another Day" with Mirwais Ahmadzai and composed with Michel Colombier. Her work on 007's 20th adventure marked a change in tact that saw the Bond composers having increasingly less oversight in the title song composition process, with the Bond producers opting to allow big-named musicians have creative control over their title tracks. It is notably that, in contraction to the many collaborative efforts between Bond stalwart composer - John Barry - and his various title song artists, David Arnold's score is absent of even the remotest refrains of the title track. For the first time the plot would blend with the title theme as Bond's North Korean torture sequence is a strong element of Daniel Kleinman's title sequence. March 2002 also confirmed another first, Madonna would better Shena Easton ("For Your Eyes Only"), who appeared in the main titles, by actually playing a role in the forthcoming Bond adventure. True to the announcement, Madonna appeared as Gustav Graves' sour-faced fencing coach, Verity. The music video for DAD premiered on MTV across the world on October 10th 2002. The video was shot in Los Angeles in early September by directing team Traktor. The single made its worldwide release on 22nd October 2002, and also appeared as one of the tracks on Madonna's 2003 album "American Life". The track met mixed reviews, with some labelling it "brilliant" but other reviews called it simply "flat". Madonna did receive a Golden Globe nomination for Best Song at the 2002 awards but, along with many other facets of the 20th Bond outing, Madonna's track was shortlisted for the ignoble Golden Raspberry Award for Worst Original Song.